Sloppy Joes are a go to meal around our home when we are looking for a simple, fast meal. You can take a cheat and use a product like Manwich … But that’s not really saving you all that much work as this is a simple dish. 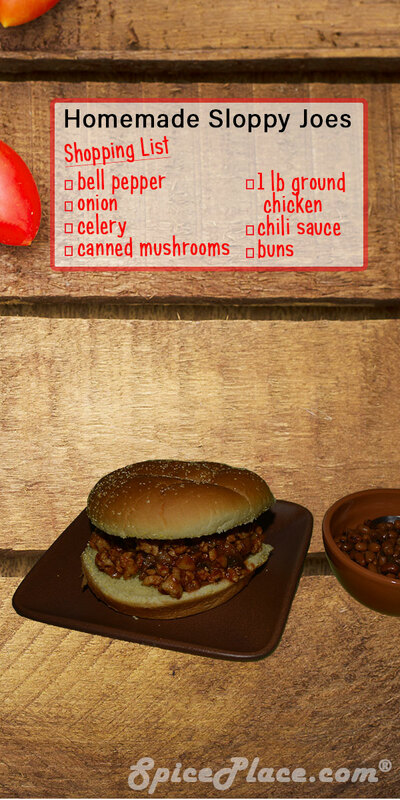 So, here is our recipe for a simple and tasty sloppy joe. We use ground chicken. You could replace that with ground turkey or ground beef. Yet, this is one of those recipes with flavor that the lighter tasting meats like chicken and turkey excel. Cook pepper, onions, and celery in a little canola oil or butter over medium heat until just tender. 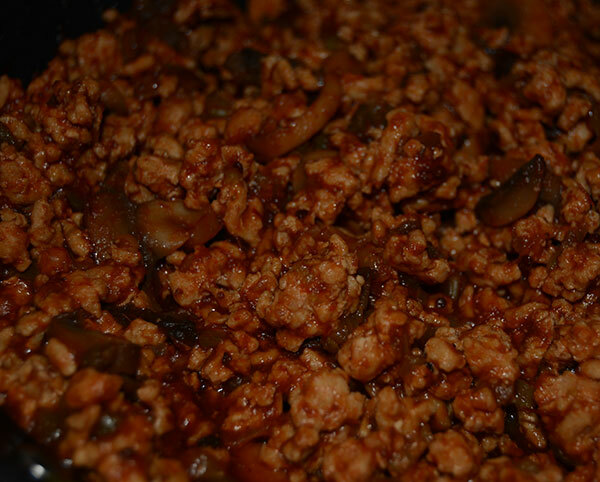 Add ground chicken (or your choice of meat) and cook, stirring/turning often until lightly browned. 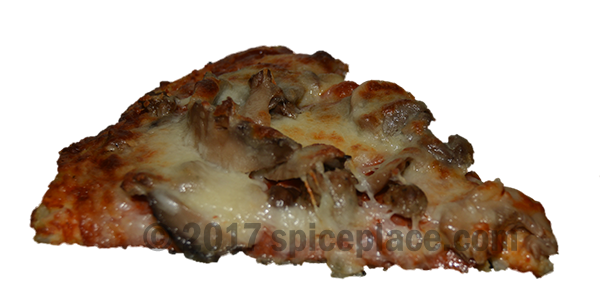 If using fresh mushrooms, add and cook for 10 minutes over low-medium heat; Otherwise add can of mushrooms and stir in. Add chili sauce and simmer, covered for 5 minutes longer. Serve on a toasted bun. Sides that go well with Homemade Sloppy Joes include: Baked Beans, Cole Slaw, French Fries, Macaroni Salad and Onion Rings. This is our recipe for a Five Way Chili Bowl. We’ve been making chili this way for a long, long time. And while we’ve tried many seasoning blends for making chili, we’ve found the French’s Chili-O (which is also sold as the identical product as Durkee Chili Pronto), makes an excellent tasting chili very quickly. This recipe is called Five Way Chili because of it’s five main layers at serving time: 1) Your favorite pasta, 2) chili, 3) beans, 4) diced onion and 5) shredded Cheddar cheese. You could make it Six Way by topping with some hot sauce. So you can make recipe from start to finish in, say 20 minutes, 29 minutes tops. First, start your oven at 400° F. Then mix up a prepared cornbread mix. We like to pour the cornbread into cupcake liners inserted into a muffin pan. This makes cleaning up the pan easier and helps hold together any leftover cornbread for a snack later on. Then toss the cornbread in the oven and bake according to the package instructions. Next, start making the Chili. You can use your own recipe, and skip ahead to the assembly instructions or make our recipe for Chili-O as described here. Chili-O makes making Chili quick, easy and as I already said, is our go to chili seasoning. 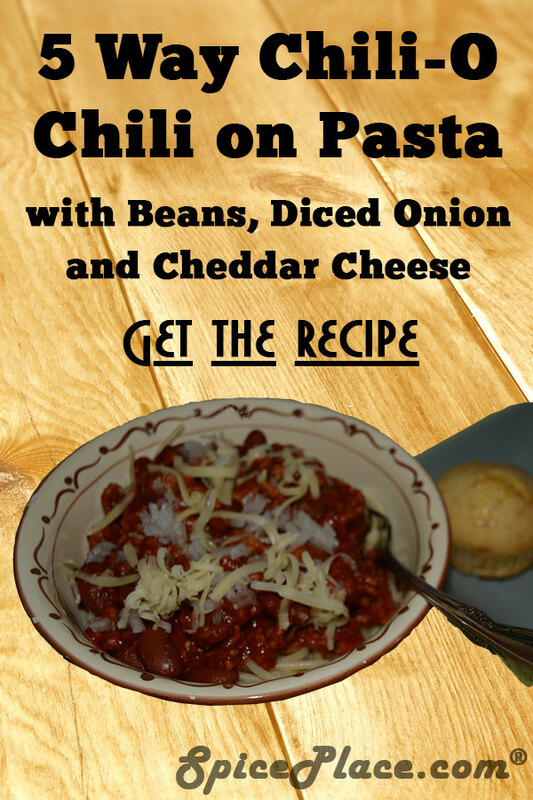 You can find Chili-O here at Spiceplace.com by following the link in the ingredients list. In a large non-stick skillet brown the ground beef. Drain fat. Meanwhile, prepare your favorite pasta. We use spaghetti or linguine pasta. Stir in French’s Chili-O Seasoning. Add tomatoes, and kidney beans. Mix well. Bring to boil while stirring frequently. Reduce heat, and simmer for 10 minutes. Stir occasionally. Add pasta to a bowl or on a plate. Don’t use too much pasta as it’s best with the chili mixed in well. Now add enough chili to mix together and coat pasta well. If you followed our instructions above, the beans are in the chili so you have 3 Way Chili already. Now it’s time to add the last two toppings, some freshly diced onion and some shredded Cheddar cheese. And you have Five Way Chili and it’s time to enjoy. Serve with one or two cornbread muffins. Note this recipe would work well with elbows (ala Chili-Mac), egg noodles or penne. We’ve tried many and have settled on the spaghetti. While Buffalo Wings are the standard fare when cooking chicken wings, sometimes we get the feel for the islands. 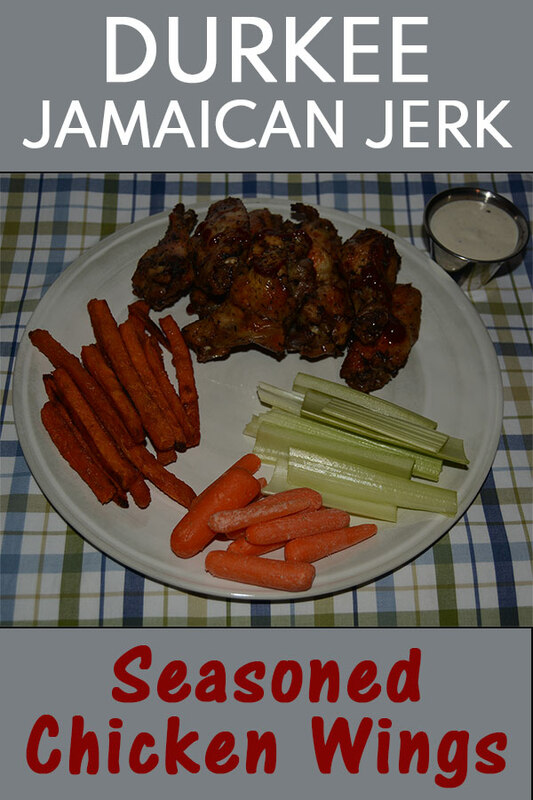 This Jamaican Jerk Seasoned Chicken Wing dinner fulfills that Island desire. Plus there is minimal preparation and it’s baked in the oven so it’s not a time demanding meal. Add lemon juice, water and Jamaican Jerk Seasoning to a measuring cup and mix. Place chicken wingettes in a large gallon sized zipper style plasic bag and pour seasoning mixture over the wings. Seal bag and shake or turn over to evenly coat wings with seasoning mixture. Place in refrigerator for one hour to marinate. Place wings on a single layer in a large baking pan, cover with aluminum foil and place in oven. Bake for 1 hour total, removing cover after 45 minutes. Test for doneness (180° F) with meat thermometer. Serve with cutup celery, carrots, blue cheese dressing and fries (sweet potato fries shown in picture) and Sriracha Hot Sauce. 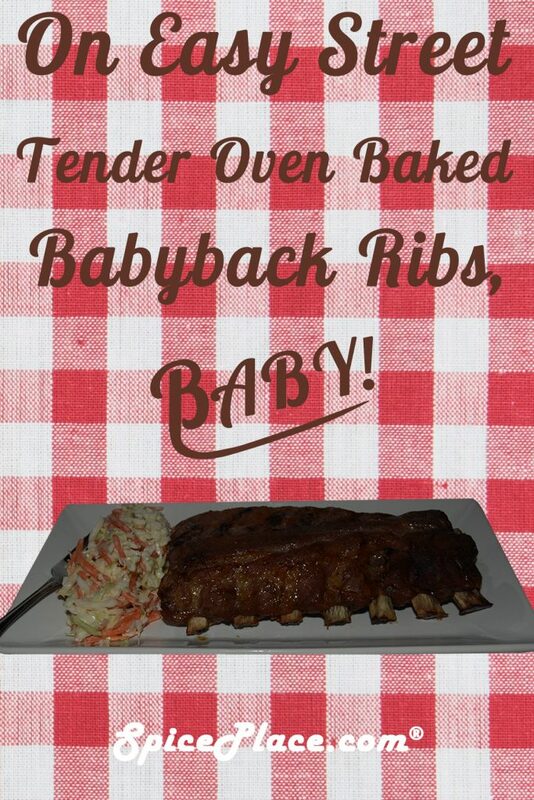 On Easy Street Tender Oven Baked Pork Baby Back Ribs, Baby! Years ago it was really a difficult process to make a set of tender pork ribs. We used to pare boil, then smoke them slowly on the barbecue and yet they still didn’t come out tender. But all of that has changed. These days there is nothing to making a tender rack of ribs at home – even in your oven as we are doing here. Simple season the ribs with your favorite seasoning and bake for an hour at 350° F. Test for doneness with a thermometer in center of meat and it should be 165° F. For a visual check, the meat should be just beginning to pull from the bones. But do use the thermometer for your food safety. Place ribs in a shallow baking pan and sprinkle seasoning evenly over them. Bake for 1 hours (or until internal temperature is 165° F.
Serve with cole slaw and/or potato salad. Somehow Buffalo Wings became the staple meal for the Big Game. And while lobster seems like an expensive, once in a while special treat, the price has come down lately so the price per serving of this recipe is quite reasonable. This is a simple and yummy meal that’s ready in minutes. These are best served on top sliced frankfurter rolls just like is done in Maine . Look for these top sliced rolls at a grocer carrying Pepperidge Farms bakery goods. The buns are baked so they are warm. Add the cold lobster salad mix into the hot buns and serve immediately. The contrast of the warm bun with the cold lobster is part of the experience in eating this dish. Preheat your over to 400 degrees F.
Split open the frankfurter rolls and butter lightly. Bake the frankfurter rolls until lightly browned. Combine the remaining ingredients to form a lobster salad and mix well. Season with salt, pepper, hot sauce and lemon juice to taste. Evenly distribute the prepared lobster salad mix into the 8 buns. † You may substitute side sliced rolls if unable to find top sliced frankfurter rolls. †† Because the lobster salad is served cold, this meal turns out equally well with fresh cooked lobster, store cooked lobster or frozen cooked lobster meat from the grocers frozen food section. The latter frozen lobster is a cheat that saves a few steps in making this recipe. Something Different Tonight, Pizza made with a Cauliflower Crust. Make something special for dinner with this pizza made using cauliflower as the crust. Yes, cauliflower the vegetable. 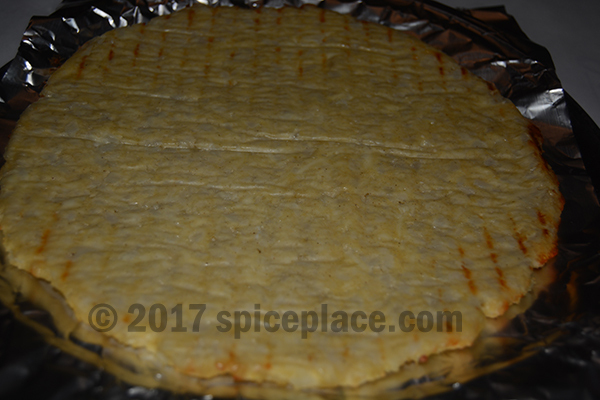 Cauliflower and Mozzarella cheese are blended, then pre-baked into a crust. 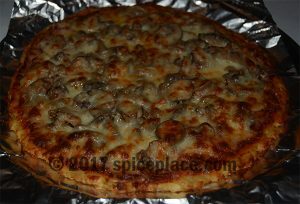 Then top with your favorite pizza toppings and bake. 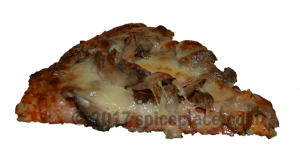 This pizza turns out very well and if no-one was watching you, they might not know that they were eating their vegetables with that pizza you served them for dinner. Secret veggie-agent-cooking. Shhh. The first time you make this cauliflower pizza crust it may seem like a lot of work. Yet, like lots of things in life, once you get the grasp of doing it, you’ll find it’s a piece of cake. Let stand covered for 1 minute. Line a large baking pan or other flat dish with paper towel and spread out the cooked cauliflower and allow to cool for about 10 minutes. Place cauliflower into a large mixing bowl and add the remaining ingredients. Mix well and form into a ball. 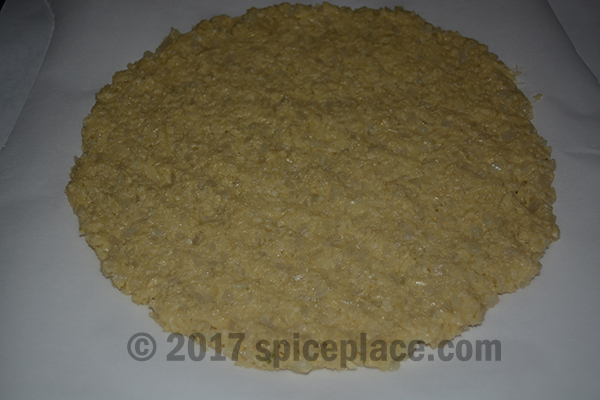 Line a round pizza pan with parchment paper then form the cauliflower dough into a round pizza crust and place on the pan. 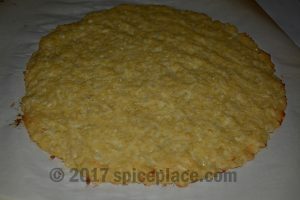 Place a cookie cooling rack in the oven and slide the pizza crust on the parchment paper onto the rack and bake for 15 to 18 minutes until lightly browned. Remove crust from oven. Let cool for 10 minutes. Carefully flip crust over. Do this by placing round pizza pan on top of cooled crust and flip cookie cooling rack. Top with your favorite pizza sauce and toppings. Return to oven and bake for 10 to 12 minutes until cheese is melted. 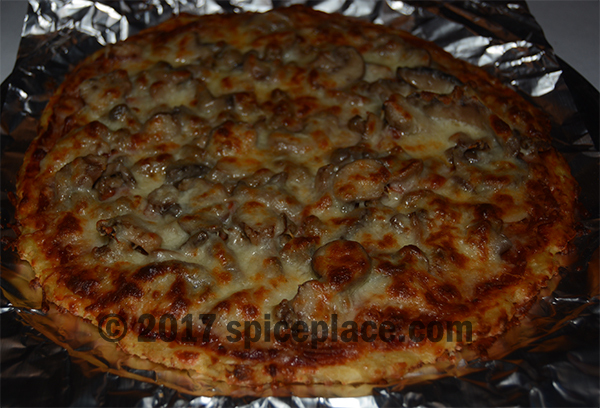 Cook longer for a crisper crust or cook on a pizza stone. Remove, slice, and eat white hot but not too hot! † A food processor makes this step a breeze. Or you can check your grocer to see if they carry a prepared package of riced cauliflower. But it’s really not that hard to chop a cauliflower with a plain old kitchen knife. ††Microwave ovens vary so watch as you cook as yours might cook faster). 9. 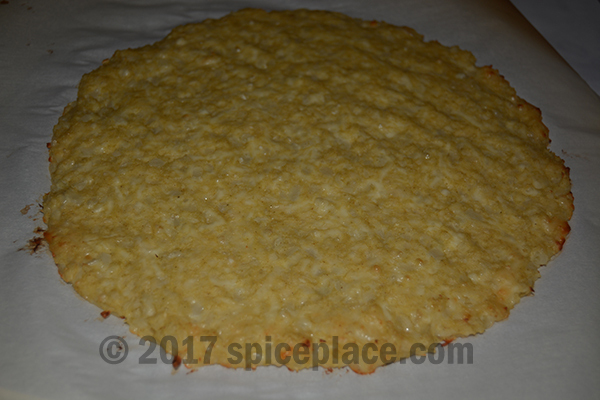 Fully prepared cauliflower pizza crust ready for addition of toppings. 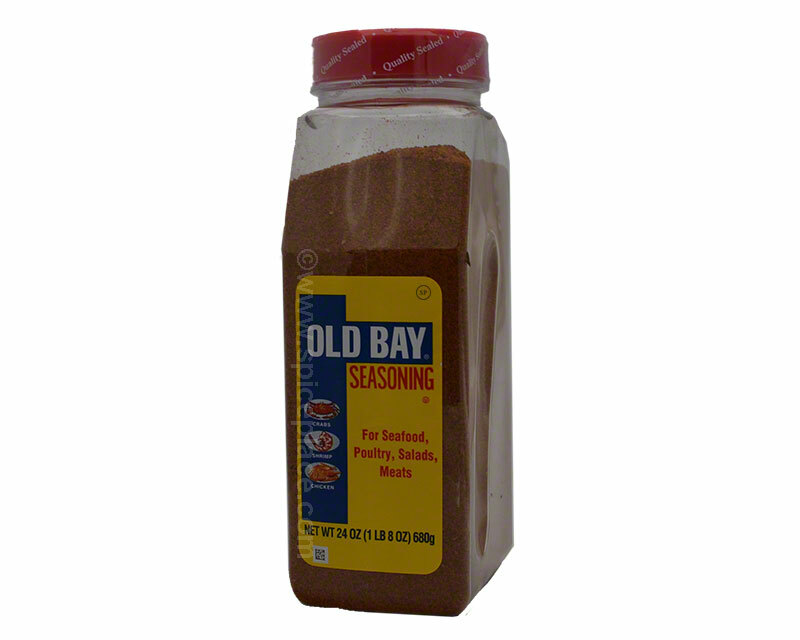 Here in Maryland, Old Bay Seasoning is almost as common as table salt so Old Bay is our go to seasoning. Originally Old Bay Seasoning was a seasoning for steamed blue crabs, yet it goes well with many other foods including fish, shrimp, crawfish and chicken. For a quick, delicious weeknight meal that everyone enjoys, nothing could be easier than Old Bay Steamed Shrimp. 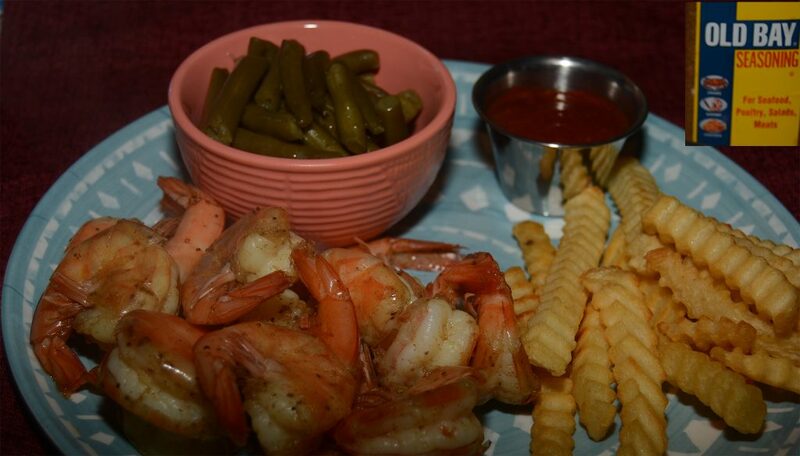 This is a really fast meal when made using quick peel cleaned and deveined shrimp. Or use wild caught Gulf shrimp too. For real tasty finger food if made with peeled, cleaned and deveined shrimp. Combine the Old Bay Seasoning, vinegar and water in a medium saucepan. Bring to a boil. Add shrimp and stir gently. Cover. Steam until tender; about 3 to 5 minutes. Zatarain’s NEW Lower Sodium Jambalaya Mix is rich and tasty and has less salt to boot. This Jamablaya Mix has only 410mg sodium per 1/2 cup serving. Plus it’s another one pan meal from Zatarain’s. This recipe is for a family size stovetop meal. A note about Andouille Sausage. We used packaged Hillshire Farms Andouille Sausage which is not too hot. Some Andouille Sausages have a lot of heat, so if you are using another type of Andouille that you are not familiar with, it’s wise to test the sausage flavor after cooking and before adding the rice mix. You might have to cut the quantity of Andouille back if it’s really spicy. In a very large skillet, cook the chicken and Andouille Sausage until done. Add 2 cups of water and butter, cover, and bring to a boil. Meanwhile mix the Jamabalya Mix together well, and measure out 1 cup. 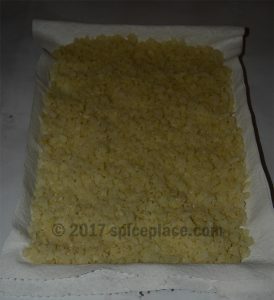 Seal remaining mix in a reclosable plastic bag. Add the Jamabalya Mix to the sauce pan, stir well. Return to a boil, then cover and simmer for 20 to 25 minutes (until water has absorbed). Remove from heat and let sit for 5 minutes. Fluff the mix and serve. Spatini Seasoning is a versatile mix of Italian seasoning typically used for preparing Spaghetti and other pasta sauces. Yet, Spatini Seasoning is widely used as a “secret ingredient” in many other meals. 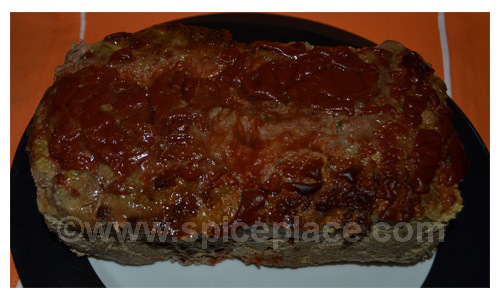 Today’s secret recipe is for a lean Turkey Meatloaf with no fillers. 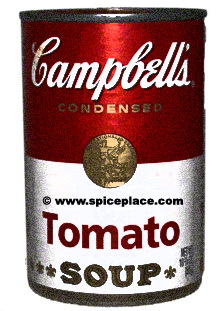 Just meat, seasoning, green pepper, onion, and Campbell’s Tomato Soup. It’s simplicity doesn’t portend the great taste of this recipe – we think you’ll be pleasantly surprised. While there are lots of recipes that use Campbell soups and it sort of feels like cheating, this Spatini Meatloaf Recipe is different, as the Tomato soup is used as a topping only — that is, it’s not incorporated into the Meatloaf mix. Plus, this recipe takes what is usually thought of as bland ground turkey and really jazzes it up. In a large bowl combine to ground turkey, green bell pepper, yellow onion, Spatini, Italian Seasoning and egg. Mix well. An excellent way to do this is to wear a pair of disposable latex of nitrile gloves and dig in with your hands, mixing the meat mixture like you are kneading bread. Place in a lightly oiled bread loaf pan. Bake for one hour or until internal temperature reaches 165° F. Remove from oven. Let stand for 5 to 10 minutes. Remove from pan to a serving plate. Serve with a fresh steamed vegetable and mashed potatoes. This recipe makes about Eight 1/4lb servings, so you may have some leftovers. 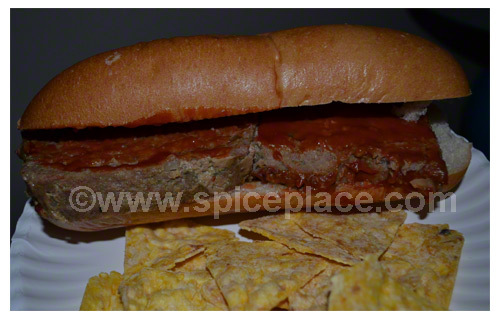 For a quick lunch, you may place a heated slice of meatloaf (cut in half to fit the roll) on a submarine roll, top with some of the leftover Tomato soup, (lettuce, sliced tomato, onions, and mayonnaise, if desired) and serve with potato or popcorn chips. 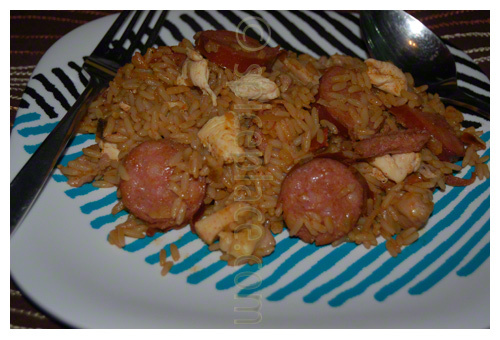 If you are looking for an easy and tasty dinner then this recipe using Zatarains’s Lower Sodium Creole Rice Pilaf Mix is something to consider. Easy to make and delicious, low in sodium, and on the table in 30 minutes. First, measure 2 1/3 cups of water into a 3 quart saucepan. Cover and bring to a boil. Meanwhile, cut up 3 boneless and skinless chicken thighs into 1/2 inch cubes (this is easiest to do if the chicken is 1/2 thawed and so is still a little stiff from being frozen). When the water is boiling add 1 tbsp butter and 1 1/3 cups of Zatarains’s Lower Sodium Creole Rice Pilaf Mix. Return to a boil, stir and shake the pan to level the rice to the water, then reduce heat to a simmer, cover and cook for 20 minutes. While the rice cooks, cook the chicken in a non-stick skillet lightly oiled with olive oil. Turn often and cook through until the chicken is done. Set aside until the Zatarain’s Creole Pilaf Mix is cooked and no water is remaining. 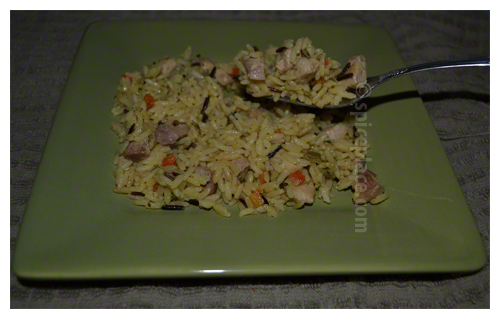 Add the chicken to the Creole Rice Pilaf Mix, stir in well, then recover and set aside for 5 minutes. Then serve. Makes 4 servings.